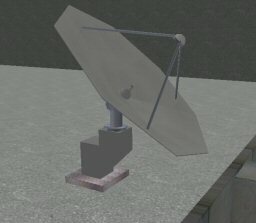 Say goodbye to communication landlines with these high tech satellite dishes. Comes in both medium and small sizes. Small dishes can be wall mounted with some quick adjustments to the mount. The base object will be the center of the dish mount. If you're trying to wall mount, make the base object's axis point right flush with the wall.